Aberdeen defender Mark Reynolds wants to end the year with six points. 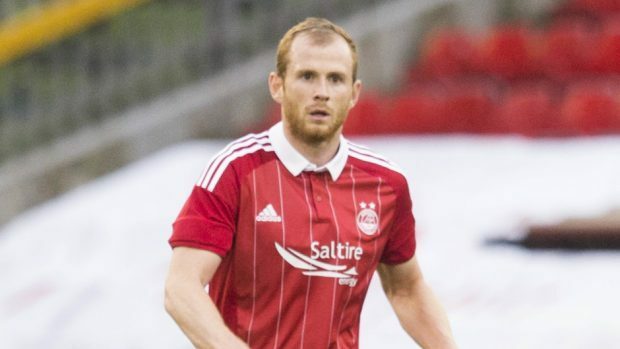 Aberdeen defender Mark Reynolds is confident the Dons are ready to get over the finishing line this weekend after allowing a first chance to seal second spot pass them by. A victory against St Johnstone on Saturday would have effectively guaranteed the Dons a third successive runners-up position in the Scottish Premiership, but the Perth Saints ran out 2-0 winners with late goals from Danny Swanson and Craig Thomson. Reynolds, an unused substitute in the defeat, reckons his team-mates are ready to take out their frustrations on Hearts when they face Ian Cathro’s side at Tynecastle on Sunday. He said: “We don’t like losing, it is not something we are used to. We haven’t lost many games this season so it is hard to take when it happens, especially the manner of Saturday’s defeat and the way we lost those two goals. “We have suffered setbacks before this season and we have always answered and we will be looking to do that again. “It is going to be a big game but we have put ourselves in a situation this season where they are all big games. “We are one win away from pretty much securing second place. We have that to look forward to and then we can concentrate on the Scottish Cup final. “This will be a massive game against Hearts as they are still pushing for a European spot. The Dons have taken seven points from a possible nine against Hearts this season but Reynolds expects a difficult match on Sunday. He said: “We won’t underestimate them as they are in the top six for a reason and can give anyone a run for their money on their day. “Every win at this stage of the season is huge. St Johnstone picked up three points last week when other teams were looking for us to do them a favour. “I think every team apart from Celtic is still playing for something in this league. Reynolds was left on the bench in November’s 3-0 defeat by Celtic in the final of the Betfred Cup and is determined to prove he deserves a starting spot against the Hoops in the Scottish Cup final on May 27. He added: “I have just returned from a double hernia operation. “I sat out the last game before the split against St Johnstone, managed to play 70 minutes in the semi-final against Hibernian and then sat out on Saturday.